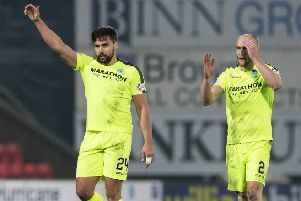 Tim Clancy’s hopes of hitting the Hibs comeback trail suffered a crushing blow after the defender was hit by another injury. Clancy, out for five months with a persistent groin problem which required an operation, turned out in the East of Scotland match against Duns as he aimed to further hone his fitness, having made a 65-minute return in a closed-doors match against Rangers. But the 29-year-old managed to play only 33 minutes of a game which the Hibs youngsters eventually won 6-0 before being forced to hobble off with what is understood to be another groin injury, although it was not immediately apparent whether it was a recurrence of the previous problem or fresh damage. While the club’s medics will assess Clancy over the coming days, it will be a further frustration for Pat Fenlon, who had believed the lengthy casualty list with which he has had to contend since the start of the season was beginning to ease, the Hibs boss having been forced to chop and change his back four on an almost weekly basis so far. As Clancy played at East Mains, James McPake was among the substitutes as Hibs came from behind to beat St Johnstone at McDiarmid Park, the club skipper featuring for the final 20 minutes of the 2-1 win as he replaced Lewis Stevenson who had picked up a knock. And although Hibs had gone into the game without Northern Ireland left back Ryan McGivern, who has been recovering from a knee injury, Fenlon believes he will be ready to face struggling St Mirren at Easter Road this weekend as Hibs seek to extend their unbeaten run to five matches. The sight of midfielder Paul Cairney, who has yet to kick a ball in anger this season after suffering ankle ligament damage in training, taking part in the warm-up in Perth would also have heartened the manager who will now be hoping Clancy, who endured an injury interrupted first season at Hibs, isn’t facing another lengthy spell on the sidelines. Also pleasing for Fenlon was the sight of strikers Paul Heffernan and James Collins both getting their first goals for Hibs as the Capital club became the first side to beat St Johnstone at McDiarmid Park since last November when Cairney’s goal earned a victory for the men in green and white. Hibs face Hearts in the Under-20 derby at Newtongrange’s New Victoria Park tomorrow (kick-off 7pm).